Bosch released the Measuring Master App in August 2016. 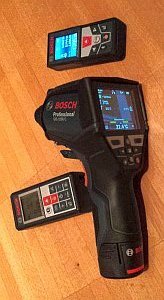 It works together with the GLM 50 C Professional and the GLM 100 C Professional laser measures as well as the thermo detector GIS 1000 C Professional. It combines the previous GLM measure&document, GLM floor plan and GIS measure&document apps. Planners and tradespeople will be glad to use the new app as it makes construction documentation easier and more efficient by further extending the functionality. You do not have to switch between apps any longer. The app is optimized for both tablets and smartphones. Professionals can now digitally record, manage and process their measured values in only one app: the Measuring Master App. As soon as the app will be available we will start testing. The measuring tools are already waiting: The GLM 100 C Professional, the GLM 100 C Professional and the GIS 1000 C Professional thermo detector. Which differences can be stated if Bosch’s new app will be compared to Leica’s Disto Sketch App? Different trades can be specified: architect, carpenter/joiner, electrician, HVAC, drywaller, painter, floor installer, tiler, roofer or custom. Of course, these assignments can be changed manually. The app searches for measuring devices with activated Bluetooth and proposes these for use. The output contained in a complete PDF export includes the following information. notes and to-dos can be included in plans and drawings and can also include photos. The thermal measurement parameters include the surface temperature, the emissivity value, the relative humidity, the room temperature, the average surface temperature and the dew point temperature. What did we notice during testing? We tested the Android version of the app with a Samsung Galaxy S4. The GLM 50 C and the GIS 1000C thermal detector could be connected using Bluetooth easily to the Android-phone. The app detects the device and can pair them. But our GLM 100 C laser distance measurer could not be connected to the app. The app finds the distance meter, but the coupling does not work. This fact surprised us as because Bosch has specified the app exactly for these 3 devices. Our GLM 100 C is older and probably belonged to the first devices. However, the Bluetooth connection to the previous app “GLM measure & document has always worked with the Bosch GLM 100 C: not only in our tests but also in many use cases on several sites. The “Detailed Plans” function is suitable for creating detailed floor plans. The wall view function also enables walls to be individually adapted. Angles, doors, windows and sockets can be inserted and their dimensions changed. You can also add texts and audio memos here. This function is especially suitable for architects, civil engineers, estate agents, electrical engineers, etc. The “Quick Sketch” function enables you to create a floor plan sketch with 90° angles. A Quick Sketch can be converted to a detailed plan. The “Quick Sketch” is deleted after the conversion. This function is especially suitable for everyone who wants to get a quick impression of the floor plan, such as tilers, planners, etc. With a little practice succeed simple floor plans soon and you can also capture walls with window and door openings, as well as doses of the electrical installation. When trying to enter a room with an intricate plan to scale properly with the app, we had to give. Since we or the app came to our limits. One reason may be that the instructions and documentation app was not available. What happens if you change the length of a wall, will a second wall change as well? Yes. The app does so to retain the layout. If the layout and the measured values contradict each other, the measured value will be placed in brackets and shown in blue. Values shown in black are calculated by the program. Using the Lock functions (padlock symbol) you can also lock walls so that they are not automatically adapted. If you like to import photos as addition to your plans or to include and show measurements these common image formats (JPEG, BMP, GIF, PNG) are supported. The PDF output summarizes a lot of useful information. The PDF which can be exported by the app can then be sent as an attachment of an e-mail. But we noticed an error in this PDF. The plan that is part of the PDF is presented without dimensions but in a defined scale if the PDF is printed out using DIN A4 paper. Photos which have been taken by the smartphone or tablet can be completed with measuring lines. You can enter a measured value using the GLM by plotting an element in the photo and then measuring, selecting a measured value directly from the measured value list or entering it manually. We compared the length of the walls on this printout of the plan and were sure that there is an error that can only be explained by a “bug” in the app. Here we offer a look at the PDF export of MasterMeasuring app with some of the data from our test cases. Bosch would have done a good job if they had improved some points and corrected the errors. This app is one step towards the future of measuring and documentation. Unfortunately there are the incompatibility of our GLM 100 C and the PDF showing wrong distances or wrong scale. Perhaps the date for the availability of the app was set too early for August 2016th. The app provides advantages over the previous individual apps. Till now these older apps are still available. In the longer ran this will probably no longer be maintained and will probably disappear from the app stores. For a quick overview provides the first video. In less than 2 minutes, the most important thing is shown. The second video is in the details and gives important information about the application and the practical use of the app. Who wants to deal seriously with the app should watch this movie; It is worth it.